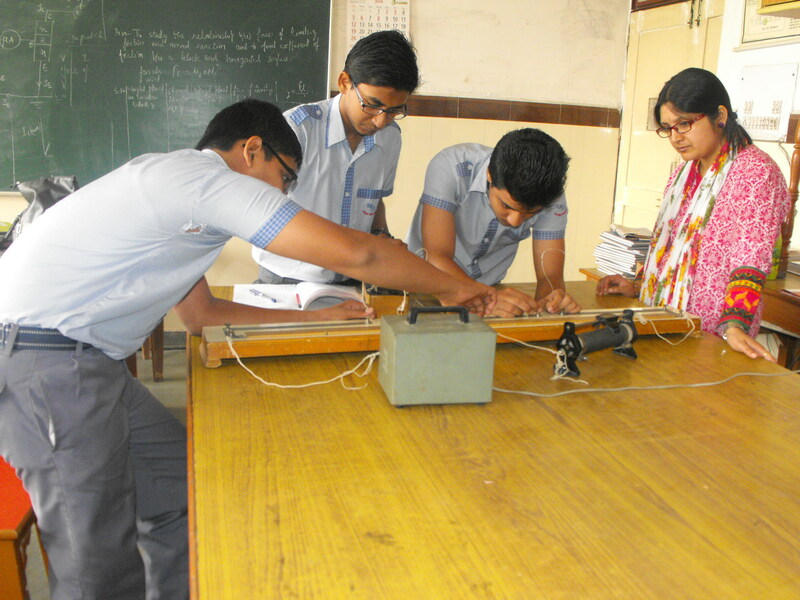 Physics Laboratory of Himalaya Public Sr. Sec. School is properly ventilated room where provision of multiple sockets and extension cord is provided to perform the practicals related with electricity. There is availability of generator so that the practicals can run smoothly even in the time of power cut. Various charts are displayed on the walls to create healthy atmosphere for performing practicals. The lab is facilitated with tables of different sizes for performing various practicals related with optics , electricity etc. wooden cupboards for storing various instruments like rheostat, galvanometer , voltage ammeter, potential eater, high resistance box, low resistance box, keys, battery elevators, spring balance optical benches and many more. The lab also facilitates the students to perform special experiments which can only be done in dark room as curtains are there to restrict sunlight. Along with teachers the lab assistants are always there in the laboratory to help the students in performing experiments. We create a healthy environment for all the students so that they perform the practicals with zeal and enthusiasm.